We were getting to Bali from Manila. The flight was easy only 4 hours at night time. And once we landed to Bali we had a few questions is how to get to Bali from the airport. In this case how to get to Ubud from Ngurah Rai International Airport in the cheapest way. Once you arrived to the airport you have a few options to move around Bali and we will explain all of them. In this blog post we will focus how to get to Ubud from Bali airport. Read here our full travel guide to Ubud. Apart from transportation from the airport we will explain about Visa, ATM, getting a SIM card and exchanging money in Ngurah Rai International Airport. These are the first things that you will go when getting to Bali from an International airport. Read here how to get to Nusa Dua and things to do in Nusa Dua! Ngurah Rai International Airport is located 13 kilometers South of Denpasar and it’s also known as Denpasar airport. The exact location is between Jimbaran and Kuta. The easiest and most comfortable way to get to Ubud from the airport is by shuttle provided from your hotel or guesthouse. Also the most expensive too! The option is great if they provide for free or for a reasonable price. If there are a few of you coming together would be great sharing the expenses. Price of the shuttle is usually going from 300K to 500K IDR which is $20-40 USD. Once you get to Bali you will see machines to book prepaid your taxi. But sadly they aren’t working hope they will do soon. Taxis will offer their services. If you choose a taxi make sure they drive you with the taximeter or just ask about the price in advance. A good price from the airport to Ubud would be 300K IDR ($20 USD). The drive takes more than an hour to Ubud from the airport by taxi. The option is great if there are 3-4 for of you bringing luggage you will not have to fight to get Grab or Go Jek always that you adjust the price. If taxi drivers are charging high prices you can always go outside the airport and they to get a Blue Bird that they always turn on the taximeter. And you will get charged the exact price for the ride from the airport to Ubud. If you decide to get to Ubud by Grab or Go Jek you will have to go outside the airport to get your ride. Since they aren’t allowed to pick passengers up from the airport. It can be a problem if you aren’t bringing a hotspot with you or a local SIM card to be connected while waiting but still you can manage since they will tell you where to wait and you can see the number plate. Prices going to Ubud are around 160K to 250K IDR. We always find Go Jek cheaper than Grab. But if you check Google Maps app on your phone, it will tell you the price of both of them. So you will compare and book at your convenience opening Grab or Go Jek app. The trip will last 1 hour and 15 minutes. You just leave the airport and turn on the left. You will see on the right side the taxis and you just walk on the left until you find the sign Sarbagita (check the picture above). And choose the route heading to Batu Bulan. The price is 3500 IDR per person for an hour bus ride which is 25 cents of USD. The bus stops a few times and on the way to Ubud. It is great choice the public bus if you are heading to Sanur Beach. If you are heading to Nusa Penida you can stop in Sanur Beach where you can get the fast boat going to Nusa Penida Island. The main problem of the public bus is the waiting time. It can be more than an hour since the buses don’t have a regular schedule. So if you are traveling on a budget and you have enough time it can be your best option. Taxi drivers will try to offer their services while waiting for the bus. They will try to tell you to go outside the bus it’s not stopping there (you can always ask the staff in the airport). In our case we were waiting for more than an hour and the bus finally came. If you are bringing so much luggage no worries because the bus is almost empty and they will accommodate you with a smile. Once you get to Batu Bulan by public bus from Ngurah Rai International Airport. The first thing that we did, we bought an Indonesian SIM Card and we went for local food as cheap as $1 USD each to eat a delicious Bakso. There are two options from Batu Balung. You can get a van going to Ubud 50K IDR ($3 USD) per person it would be great if you are traveling alone (maybe you have long time waiting until more people are joining). If you are two of you or more you can try to check apps like Go Jek and Grab. In our case Go Jek gave us the best rate 75K IDR to go to our final destination in Ubud. It was cheaper than the van and we got to our accommodation without having to walk around with our luggage. If you go by van is stopping around Ubud Market and if you are going farther than Ubud Market you will have to walk on your own or negotiate a price with the driver. Finally for two people going to Ubud from Bali airport we paid 82K IDR which is $5.5 USD. If you get a taxi from the airport it will be more comfortable but expect to pay around 300K IDR. If you order a taxi with apps like Go Jek and Grab prices will go around 160-250K IDR depending the place you are heading to in Ubud. You can exchange money in the airport just crossing the ATM’s it will be a few places to do it. Official Rates are $1= 14 000 IDR. You will get lower rates than in Ubud or other place outside the airport. If you need to exchange cash jsut try to exchange small money. In Indonesia, you will become a millionaire just by exchanging your local currency ha! Click here to know the exact rate. Our best advice for you if try to skip buying the SIM Card in the airport since it will cost you 2-3 times more than in a local store in Ubud. We bought a SIM Card with Axis phone company good enough for 30 days. The price was 40K IDR and 4.5 GB internet connection. For us it was perfect since we were planning to stay more than a month and most of the places in Bali has Wifi. We will only use data connection when going around and changing places to stay in Bali. There are just a few of them once you get your luggage and after the immigration stamp you will see a few of them. Most of them will give you 100K bills and there is one will give you 50K bills. You should know 100K is around $7 USD and sometimes when you buy small things they will have no change. There was no ATM commission in the airport, so if you withdraw money in the airport you will only have to deal with your bank commissions. In our case luckily we have a card for withdrawing money that they don’t charge anything! The best time to visit Ubud is from April to October. The most hectic time in Ubud are on July and August. Make sure to remember those months so you can plan ahead. November to March is Ubud’s wet season so the beaches may not be at their best. Still, it’s worth the trip since Ubud is still beautiful during this time. Click here to know when is the best season to visit Ubud! 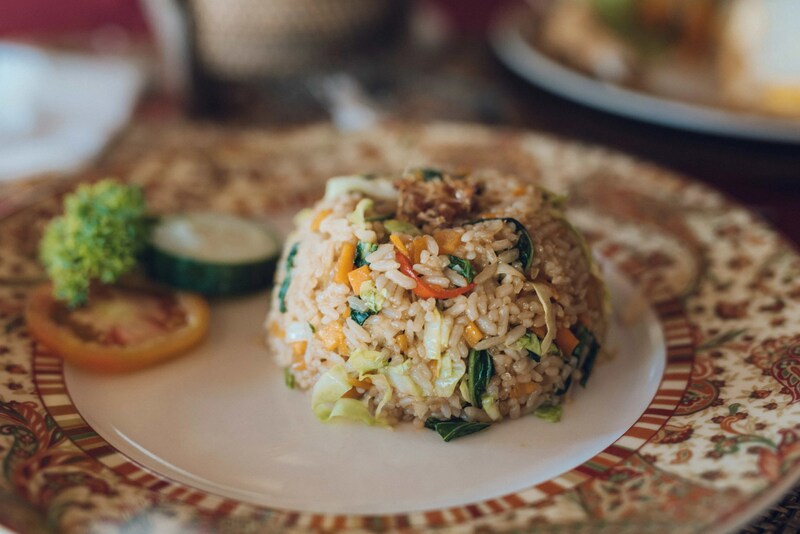 You can find cafes serving less than $1 USD and you can also eat local food like Nasi Goreng or Nasi Campur for $1-2. You can also enjoy some Smoothies and Gelato if you’re traveling on a hot season. Everything’s really affordable if you are traveling on a budget, you won’t have any problem at all. They also offer beers during Happy Hour for only $2-3 USD. For accommodation, you can find really good accommodation for an affordable price. Prices start from $7 USD in a local guesthouse depending on how much you want to stretch your budget. You can do tours (for example Tegalallang Rice fields starting from $10 USD). You can also get massages for $4-5 USD per hour and rent a motorbike for $4-5 USD per day. Ubud is really great for budget travelers. You can also try AirBnB in Bali with prices starting from 140K IDR which is $10 USD. Click here to get $30 USD off your first booking with AirBnB! Did you know that you can use public transportation from Bali International airport to get to Ubud. Do you know other ways to get to Ubud from Bali International airport? Let us know in the comments below.